Why would you need secure document shredding in Hyde? According to the Data Protection Act of 1998, you as a business owner need to comply with this legislation and ensure that all your clients’ sensitive information is secure. Failure to do so can result in identity theft, a crime that has affected over 100 00 people in the UK over the last year. To ensure that you, your business and your business’ clients information is not vulnerable to opportunistic identity fraudsters, you can make use of our secure document shredding service. For both your home and work office in Hyde, secure document shredding is a positive step towards restricting opportunities for id theft. We offer a comprehensive and affordable service that keeps your information safe, and your business’ reputation intact. The way to secure document shredding is simple, and once you begin, you will wonder why you never used this service before. Order your shred sack online. 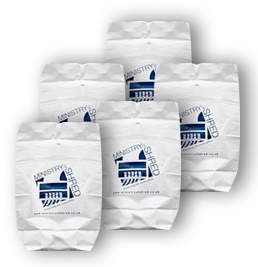 There are various sized sacks designed to meet your business’ shredding needs. 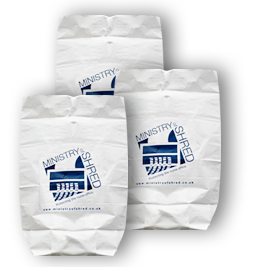 We will deliver a shred sack, complete with its identification tag. Train your employees to place unwanted documents ready for disposal into the shred sack. When it is full, seal the sack using the security tag, and give us a ring. 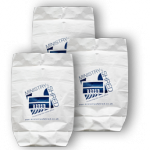 Our uniformed and security screened drivers will collect your shred sack, first showing proof of identification. Secure document shredding in Hyde includes the transporting of your unopened shred sack to our shredding facility. The sack is shredded along with its contents in our industrial sized shredding machine. The entire sack is shredded according to the British Security Industry Association standard EN1571. 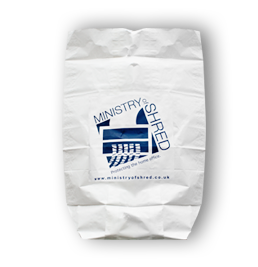 If you would like more information about our secure document shredding service, contact Ministry of Shred. Once your documents have been shredded, you will receive a Certificate of Destruction proving that your documents were correctly shredded according to BSIA standards. You will also be pleased to know that all shredded items are recycled into usable paper products. By using a secure document shredding service, not only can you be certain that your clients’ sensitive information is safe, but you will also doing your bit for the environment. This entry was posted in Secure Shredding and tagged Hyde Secure Document Shredding, Secure Document Shredding in Hyde. Bookmark the permalink.